Azera is the organic insecticide proven to get rid of hundreds of common garden pests, PLUS the extra hard-to-kill ones. It starts with a plant-made insecticide we learned to extract from daisy flowers 100 years ago called Pyrethrum, trusted by professional farmers and gardening experts ever since. We added a second plant-made insecticide that comes from the Neem tree, to provide your plants extra protection against even the toughest pests. Made from Pyrethrins and Azadiracthtin, two of the most effective botanical insecticides used by organic gardeners. OMRI listed. Accepted for Organic Gardening. What bottle sizes are available for Azera Gardening? 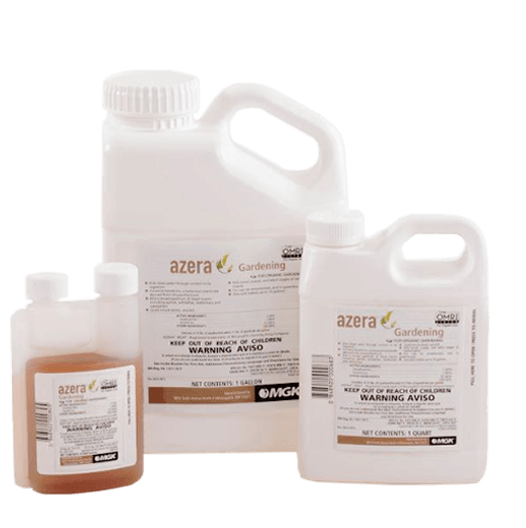 Where can I buy Azera Gardening products? How long is Azera Gardening good for after mixing with water? To ensure proper distribution of the product we recommend using the product within 24 hours of mixing it with water. How long should I wait after using Azera Gardening before I harvest my fruits and vegetables? After the product has dried, fruit or vegetables may be harvested. Is it safe to use Azera Gardening on cannabis plants? While the Azera Gardening label allows for applications to crops that can be ingested or consumed such as mint, hops and herbs, the US EPA prohibits cannabis from being listed as an approved crop on any registered insecticide. Is Azera Gardening harmful to blooms on plants and flowers? All MGK products are tested at label rates to ensure that they do not damage plants and their blooms. Make sure to read the correct label rates needed and follow all application instructions. Does Azera Gardening have an organic listing? Yes, Azera Gardening is OMRI listed and meets USDA’s National Organic Program (NOP) requirements. Does Azera Gardening kill wasp and hornets? Do not use Azera against wasp and hornets since they are not a listed pest on the label. Will Azera Gardening kill Japanese beetles? Yes when you spray it directly on the beetle it will kill them. Make sure the read the label rate for Japanese beetles and mix the concentration to that level. Will Azera Gardening kill Butterflies? Azera Gardening can be used on flowers and flowering vines. However, using the product when beneficial insects are around could be harmful. Best to apply early morning or late evening when these types of insects are not around. Can Azera Gardening be used on Citrus Trees? Yes it can, please make sure the read all label instructions for proper use.